Hello everyone! Sorry about the lack of posts over the last few days - I've been so busy with Christmas and all of that jazz, so everything's running in slow mo at the minute. We all love Top 5 posts, so I thought I'd give it a go today with a product that divides the beauty world in two; blusher! Some people love it, some people hate it. Blusher is a product I've never really gotten into up until this year - it was never something I spent a heap of money on, or collected. 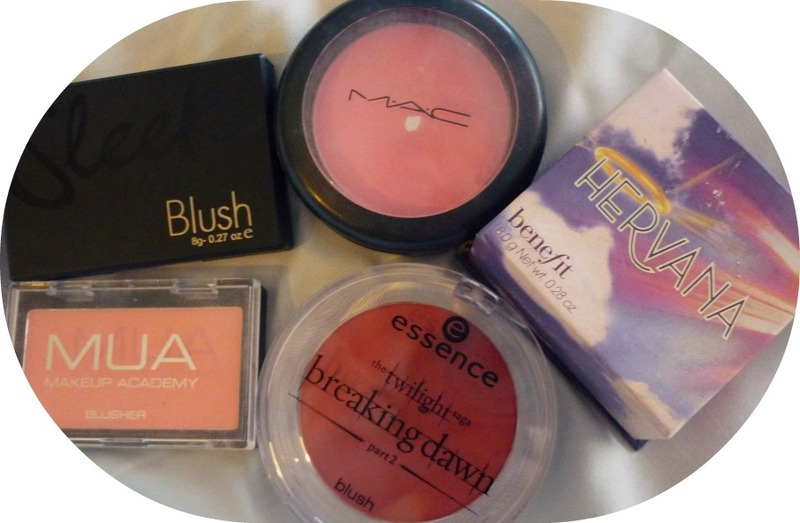 These blushers are my current favourites of my small collection, and are ones that I reach for the most. The first blusher I ever invested in, was M.A.C's 'Pink Swoon' sheertone blush in 2010. I've hit pan on it only now, but it's been my go-to blush for the last 2 years. It's a dolly, blue-toned pink; which is perfect for pale skin tones. It's a really nice colour to wear if you apt for 50s-style pinup makeup looks a lot, like me. It's not extremely pigmented but it's buildable. However, for the price MAC blushers are, I don't see myself spending that amount of money on a blusher anytime soon (it was around €17 at the time). Another ideal blush for pale skin is Benefit's Hervana (full review here) - not only does it smell delicious, it's also the perfect pale pink shade for everyday wear. Like Pink Swoon, it's not extremely pigmented but it is buildable. If I'm wearing natural makeup or a heavy eye look, I usually opt for Hervana as it keeps things simple yet alive-looking. My other three favourites are all recent purchases. I picked up the bright orange Sleek blusher in 'Life's A Peach', in London back in September. It's quite scary to look at in the pan, but it's beautiful once applied on to the skin. It shows on pale skin as a soft peach-coral shade, and it's quite pigmented so you only need to apply to smallest amount. The packaging is simple and sturdy, and it's by far my favourite blush packaging out of all the ones that I own. (Sleek makeup isn't so readily available in Ireland unfortunately, so I always stock up when I'm over in the UK.) I picked up another blusher in London from the famous bargain-beauty brand MUA; the gorgeous peachy-pink blush in Shade 1, was only £1 - for the price it is, it's great! (Unfortunately in the photo below, the bright orange from the Sleek blush reflected on to the MUA blush so the colour's slightly off in the pan.) It's pigmented, but can be chalky so be cautious not to apply too much on to your brush. My most recent blusher purchase is an Essence blusher in 'Renesmee Red', from their Twilight: Breaking Dawn Part 2 collection - I've wanted a red blusher for aaages, so I thought I'd pick this one up to try it out. 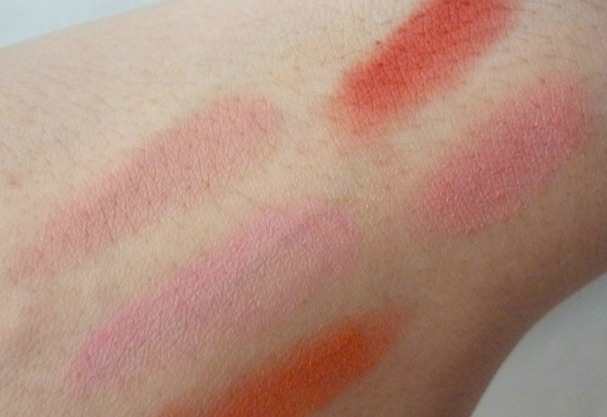 It's absolutely stunning; so pigmented, and it gives such a beautiful rosy glow to the cheeks. I'm in love with it! It was around €3, and alike to the MUA blusher, it's incredible quality for the bargainous price I paid. 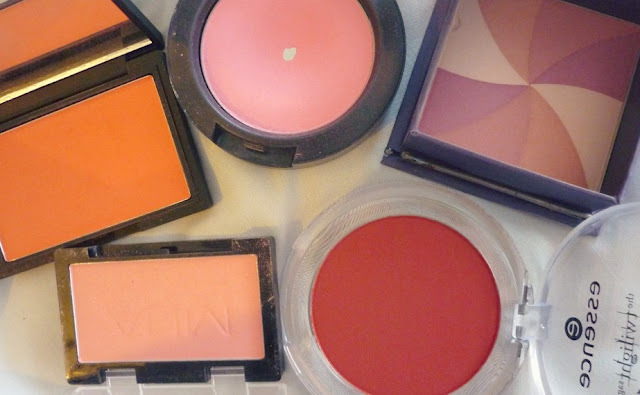 I highly recommend all of these blushers, especially if you're fair-skinned like me. I personally don't find my high-end blushers are necessarily any better than my cheaper versions, so I wouldn't advise forking out a lot for one if you're just starting out, or are curious to experiment with different shades! (Top - bottom, left -right) MUA 'Shade 1', Essence 'Renesmee Red', Benefit 'Hervana', MAC 'Pink Swoon' and Sleek 'Life's A Peach' - sorry for the photo quality, I was rushing against time to get snaps!